Here's what to stock in your paleo pantry. And a free printable paleo shopping list to get you started. Stocking a gluten-free, grain-free, paleo pantry can be a little intimidating at first. It seems EVERYTHING in the grocery store has gluten, sugar or other processed food chemicals. It is absolutely critical to read labels. I start with the assumption that any packaged food is guilty until proven innocent. I don’t eat it until I read the label and make sure I can tolerate everything that’s in it. That having been said, there are some great gluten-free, grain-free, paleo-friendly foods that I always have in the pantry or the freezer. I also keep a good supply of fresh vegetables and fruits, depending on what’s in season. I do try to buy organic produce, at least for the dirty dozen. I eat so much of those I prefer to pay a little more to get them without pesticides. The first thing you’re going to need to do is to make room for all your new healthy, paleo food ingredients. Start by cleaning out your refrigerator, freezer, and pantry. Read the label on every package in your kitchen. Anything with gluten, grains, dairy, soy, legumes, sugar or other processed food chemicals goes. 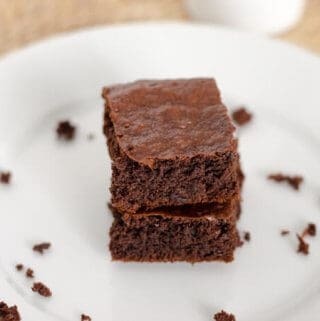 If all of the ingredients are gluten-free, grain-free, paleo-friendly real foods it stays. Here’s a link to how to read labels to avoid milk, soy, peanuts, and wheat. And here's a link to how to avoid refined sugars. Don’t forget any traditional baking ingredients you may have. Flours, sugars, even baking powder. Many baking powders have starch made from grains added to prevent clumping. I usually stick to baking soda and acid (vinegar or lemon juice) for baking. Wondering what to stock? Here is a list of some of the most used items I keep in my paleo kitchen. These are the things I reach for every day — some basics, as well as some more specialized tools and ingredients that are useful in gluten-free, grain-free, paleo cooking. 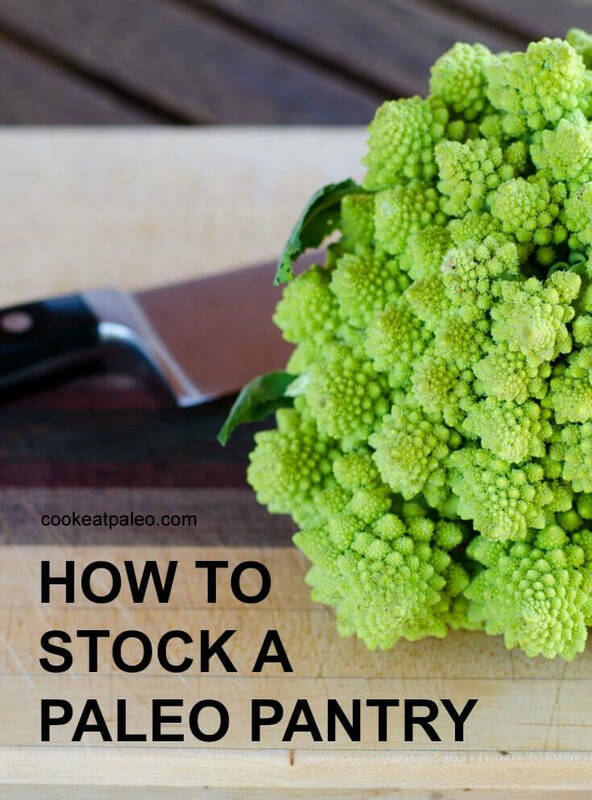 If you're wondering how to save money on stocking your pantry, here's how I saved over $1,000 on paleo food. 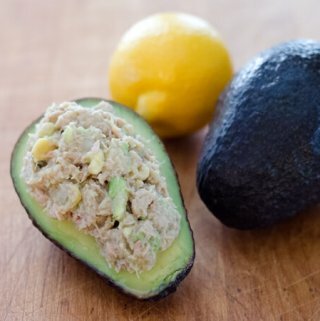 Now that you have your paleo kitchen stocked, check out these easy paleo recipes. 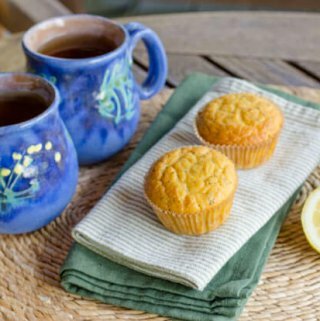 Muffin liners – I like these baking cups, muffins don't stick to them. Flavored olive oils — great for adding flavor to quick recipes. I usually have garlic infused olive oil and white truffle oil on hand. P.S. Ready to stock your paleo pantry? 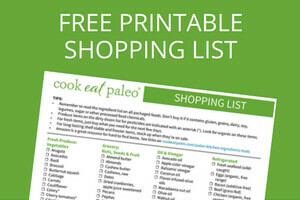 Get your free printable paleo shopping list here. Great catch, Martha! I do usually have peppers on hand — I will add them to the list. Just started this a month ago and I love it. Except I still like my soy burgers. Such a great, helpful list for those interested in the Paleo lifestyle! Great tips. I love all the paleo foods- but find it hard to have coffee without cow’s milk – have made my own cashew milk, tried coconut milk etc., but really only cow’s milk does it for me in coffee- hence I’m having less coffee! My main temptation would be when at a party and trying to avoid even healthy gluten free baked goods! Any tips for that? 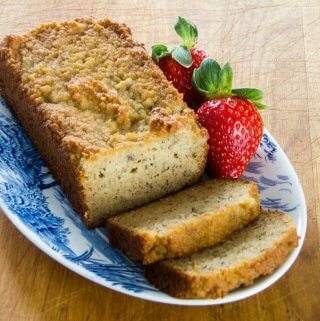 Love your shopping list, really useful, and the recipes are great. Many thanks! Please tell me the name of the green crown like vegetable featured in this article. We had once from a farmer in Maine and it was fantastic. Thank you. I’ve never heard of that vegetable. And I’ve actually never seen it in the grocery store! 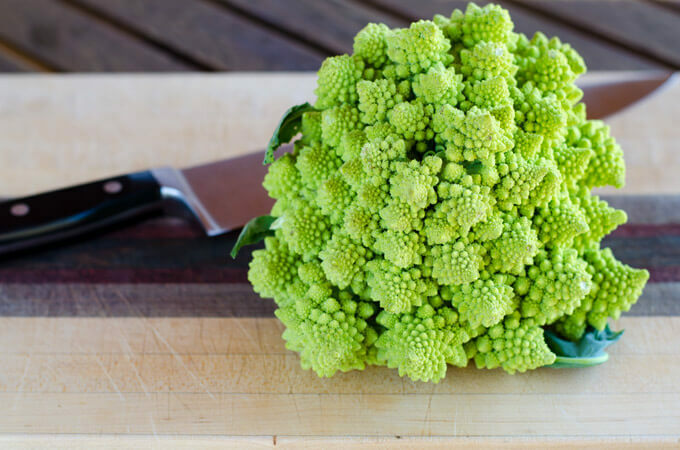 Hi Ashley, it tastes like a cross between broccoli and cauliflower. It’s in season in the fall, and that’s the only time I’ve seen it in the grocery store. Thank you so much! These are all such wonderful, nutrient packed foods! I have been looking at many different diets in order to help get my health back in check. Paleo seems to be the best fit for me (most of my issues are stomach related) with no dairy or gluten. I love the printable shopping list you have, it’s a great way for me to get my pantry and fridge ready! Thank you! What about the sausage and bacon? Aren’t they forms of processed meats? My Paleo Breakfast Sausage recipe is quick and easy to make using only paleo ingredients. This bacon is sugar free and made from just pork and sea salt. It is paleo (and Whole30 approved). One of my kids is deathly allergic to almonds. Can you suggest an alternate flour? Hi Bridget, sunflower seed flour or other nut flowers can often be substituted for almond flour. 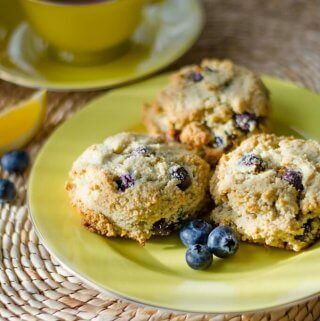 You can also try coconut flour or cassava flour, but look for recipes that are designed for them as they are not cup for cup substitutes for almond flour. Hope this helps! Great article. Another couple of pieces of kitchen equipment that I suggest some people might want to consider getting, especially if they lead hectic lifestyles are a pressure cooker or a slow cooker. Both have proved invaluable in my household over the years when I worked long hours. Absolutely Allison, both are great to have in the kitchen! Hi Colleen, I’m glad to hear you are recovering. If you sign up for email list, you’ll get a free printable shopping list and some great tips for starting out. While looking at various Paleo sites to understand and get prepared to try Paleo out….there seems to be alot of avocado use….which I’m deathly allergic to, in any form. There is a correlation to other tropical fruits as well – such as kiwi & bananas to name a couple. The effects on kiwi & banana aren’t nearly as serious – but something about avocado brings on anaphylaxis. 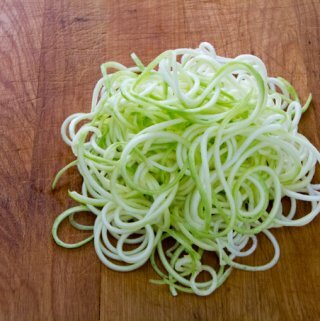 Suggestions to work around this in recipes? Currently I use unsweetened plain greek yogurt with live cultures for many things…including ‘ice cream’, in place of sour cream, dips, breakfast w/fresh berries, even in cooking/baking. However I notice yogurt – even a good healthy one – isn’t on the paleo plan….any input and ideas how to work around these issues. Thanks! 🙂 from a newbee! Hi Christy, avocados are sometimes used to add a creamy texture. Depending on the recipe, you might try cashew cream, coconut cream, or a pureed vegetable like cauliflower or white sweet potatoes. If you can eat coconut, take a look at this coconut berry parfait – it’s a great substitute for yogurt for breakfast. Thank you for working on the list. We have been eating processed food from long and eating real food can be difficult to adopt. However, i’ll make changes to my kitchen to get back to what we used to eat as child. Hi Lisa, I want to start but I have a full kitchen of food that would be needing to toss an on a budget its hard to replace everything. HELP!!! Hi Tina, you can start with the items you use will use this week. Then replace the other items as you need them. Hope this helps!